I thought this may be of interest to ol' Air Defenders. During the 26th Annual Field Artillery OCS reunion May 7, 2010, at Ft Sill, OK. LTG C J LeVan was inducted into the Artillery Hall of Fame. 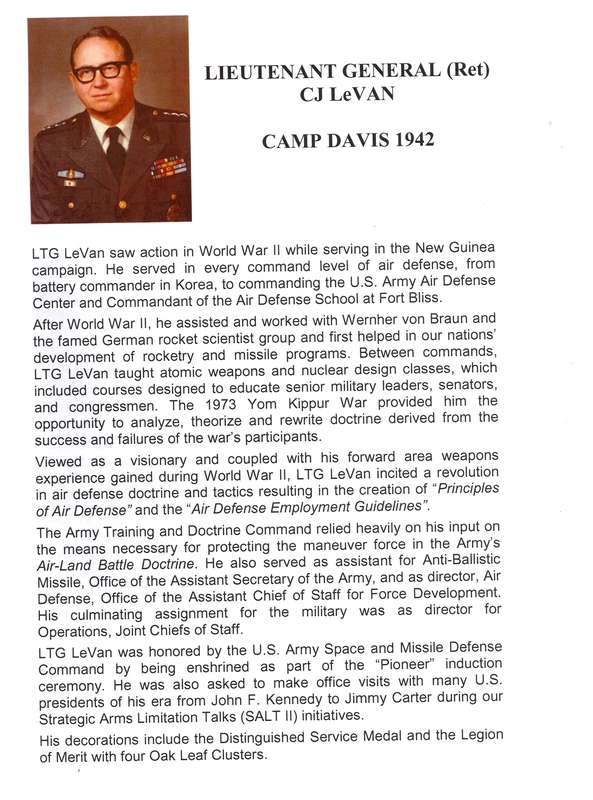 LTG LeVan was the principal creator of most Air Defense doctrine and operations. His concepts and oversight are what led to the Tactical Evaluation (Tac-Eval) system throughout the ADA community. The Ft Bliss ADA school and units have all but completely moved to Ft Sill, OK. The combined arms branches (FA & ADA) are under a concept called the US Army Fires Center of Excellence. Ft Sill now conducts Basic Combat & Advanced Individual Training. In addition it is the training center for all Field Artillery and (under completion) Air Defense including officer Advanced Courses.